The Coral Cove apartment complex sits right on Paynes Bay Beach, so heading down for a day of swimming and snorkeling isn’t a problem. As would be expected with a beachfront rental, the views from the apartment are spectacular. Apartment #1 is located on the ground floor and consists of 2 bedrooms with en-suite bathrooms, as well as an additional third bathroom. A full kitchen, living area, and dining area round out the inside of the apartment, and everything is comfortable and contemporary. Outside, there is a patio with lounge furniture - a perfect place to sip a cocktail and take in the views. With the unspoiled sands of Paynes Bay Beach on one side and lush, tropical gardens on the other side, Coral Cove #1 is perfectly situated. Guests will appreciate its short distance from the renowned Sandy Lane Hotel and from some of the island’s best entertainment spot. One Coral Cove offers guests a secluded haven where they can chill out and enjoy the sweeping views of the cerulean sea. This is an exceptionally spacious ground floor apartment, with an open-plan design and elegant, contemporary furnishings. 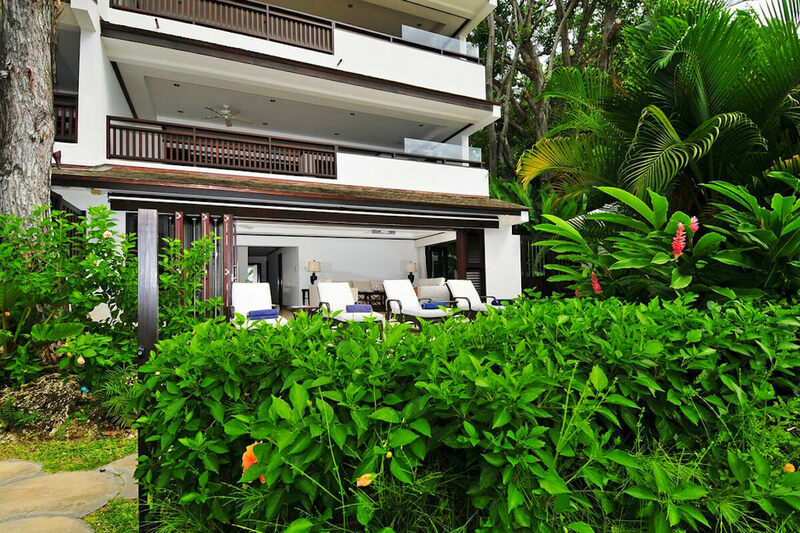 The large air-conditioned living/dining area features wide glass doors that open onto a large private patio, which offers picturesque views of the lush gardens and ocean beyond. This apartment also has two charming en suite bedrooms that open onto their own private patios. Both bedrooms are comfortably fitted with ceiling fans and are fully air-conditioned. The master bedroom has a king size bed and the second bedroom has twin beds – perfect for families with kids who want their own space! Special rates and terms apply to the Christmas & New Year period. Cook service is available at an additional fee.